When Phil Dowson was switched to the role of Saints defence coach a couple of weeks ago, some may have seen it as rearranging the deckchairs on the titanic. That view may have been amplified when the team suffered its nadir, shipping seven tries in a humbling 50-21 defeat to Harlequins at Twickenham. But, just seven days after that horror show, signs of light emerged at the end of the tunnel. 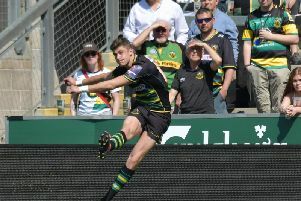 Saints stepped things up significantly, displaying renewed vigour as they finally ended their seven-match losing streak in the Aviva Premiership. Yes, Gloucester grabbed three tries in the game at Franklin's Gardens last Saturday, but the defensive showing was night and day compared to the one against Quins. Saints emphasised their improvement by holding out with 14 men after Api Ratuniyarawa's yellow card. And that prompted an enthusiastic clap from Dowson, who was watching from the touchline. So just what has the man who skippered Saints on so many occasions done to improve the defence? And why has he been able to inspire such a response from the players? "Dows took us back to basics last week," said Teimana Harrison, who was named man of the match in the 22-19 win against Gloucester. "We didn't add anything on to our defence, we spoke about who we are, about making the Gardens a castle for 2018. "At the moment, our castle is a bit tattered, a bit rundown, but we're rebuilding. "We want to put the defences up and get up and smash some people. "It will slowly become a fortress if we can get some good wins here and defend for the brothers." Dowson, Tom Wood and Dylan Hartley were three key figures in creating the culture that set Saints up for glory in the Premiership and Challenge Cup in 2014. They led the team through thick and thin, and Dowson is now doing his bit behind the scenes, having retired from playing at Worcester last summer. "He's gradually taken on more and more responsibility and we're starting to see that now," said Saints flanker Wood, who lifted the Challenge Cup alongside Dowson in Cardiff in May 2014. "He's very good at speaking in front of the group, very well prepared, very charismatic in the way he delivers and the boys are really buying into it. "It's a real shame we didn't do it justice against Harlequins, but we saw some of it last Saturday and hopefully it can be a catalyst for us moving forward. "I really hope we've turned the corner." The decision to move Dowson to defence was taken by Alan Dickens, who had previously occupied the role before being moved to attack coach and now interim head coach. And Wood added: "It's about creating an environment where individuals are willing to fully invest themselves in a philosophy and buy into each other. "It's about doing what's right for the team. "There's no right or wrong way to defend. People talk about blitz, up and out, but there's no one formula that's the answer otherwise everyone would be doing it. "It's about getting 15, 23 guys who all believe in the system and each other and will do it until the 80th minute. "At times people come out of the system because they're desperate to make a difference and actually they hurt the team by doing so. "Hopefully we're getting that belief and togetherness back."